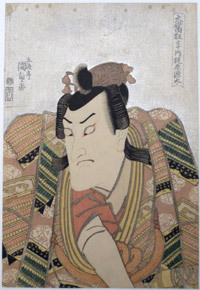 A bust portrait of the famous quick-change actor Bando Mitsugoro III as Kajiwara Genta Kagetoki. 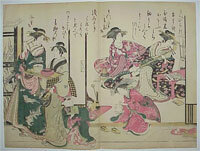 Performed at the Ichimura-za Theatre in the 3rd month 1811 ( Bunka 8 ). 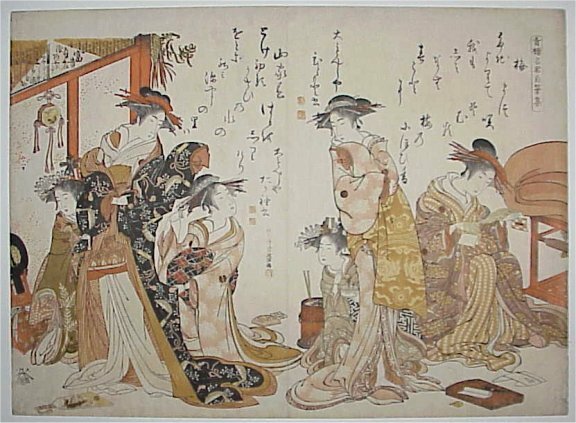 From Kunisada’s finest set: Oatari kyoden no uchi, “Great Performances.” A set of seven prints of celebrated roles of the previous eight years selected from the Oatari kyogen, “Big Hits.” Sumptuously produced with mica grounds which had not been used for twenty years. 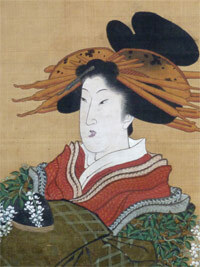 The expressive poses hark back to similar prints by Toyokuni I and Kunimasa. 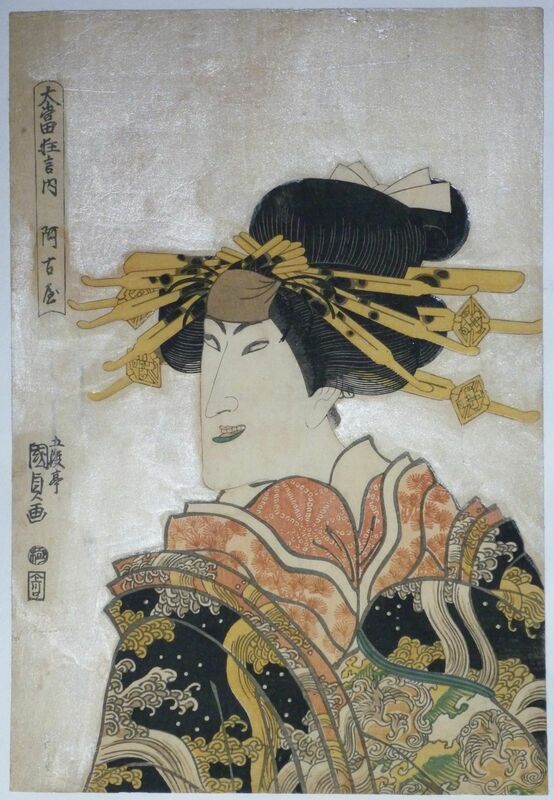 Exceedingly rare, on a par with many Sharaku prints. 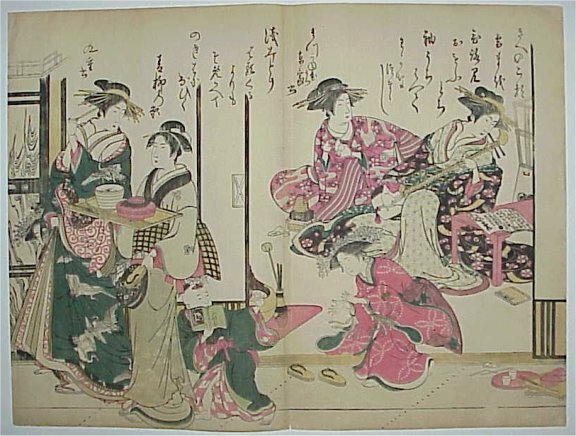 Published by Fukusendo, c 1815. Another impression is in the Rietberg Museum, Zurich. Fine impression. Slightly trimmed left side towards the top and repaired binding holes at top, otherwise good condition. Very good colour with the mica well retained. 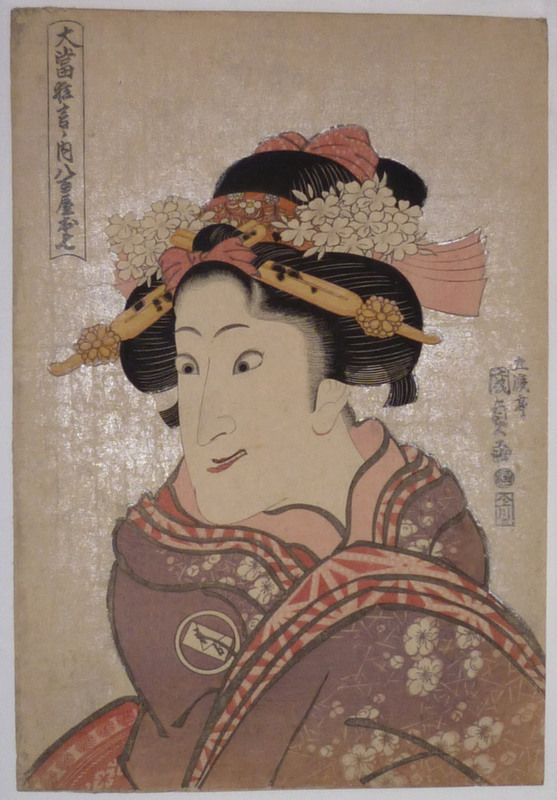 Signed Gototei Kunisada ga.
A bust portrait of the famous onnagata actor Iwai Hanshiro V in the machi musume, “town maiden” role of Oshichi. 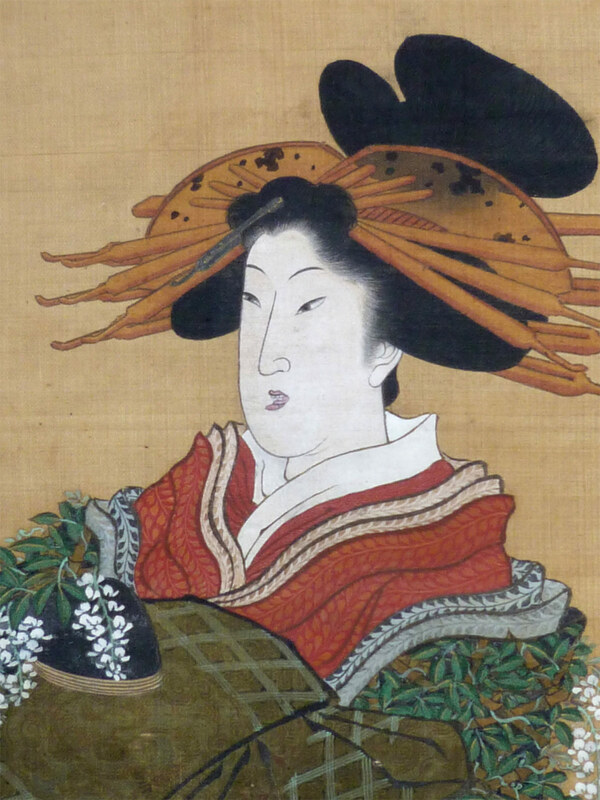 A greengrocer’s daughter, she burned down most of Edo in order to be with her lover Kichisaburo. He first performed the role at the Morita-za Theatre in 3/1809 in Sono mukashi koi no edozome. From Kunisada’s finest set: Oatari kyoden no uchi, “Great Performances.” A set of seven prints of celebrated roles of the previous eight years selected from the Oatari kyogen, “Big Hits.” Sumptuously produced with mica grounds which had not been used for twenty years. 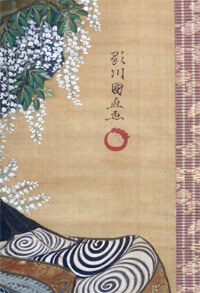 The expressive poses hark back to similar prints by Toyokuni I and Kunimasa. 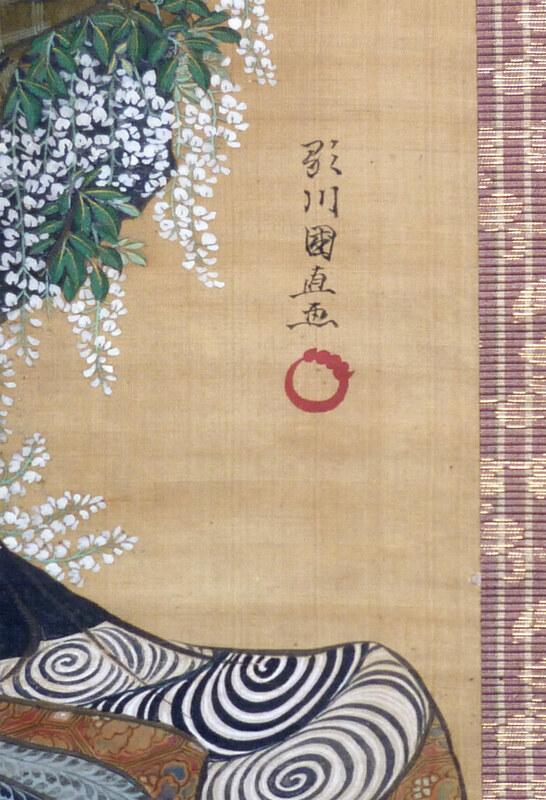 Exceedingly rare, on a par with many Sharaku prints. 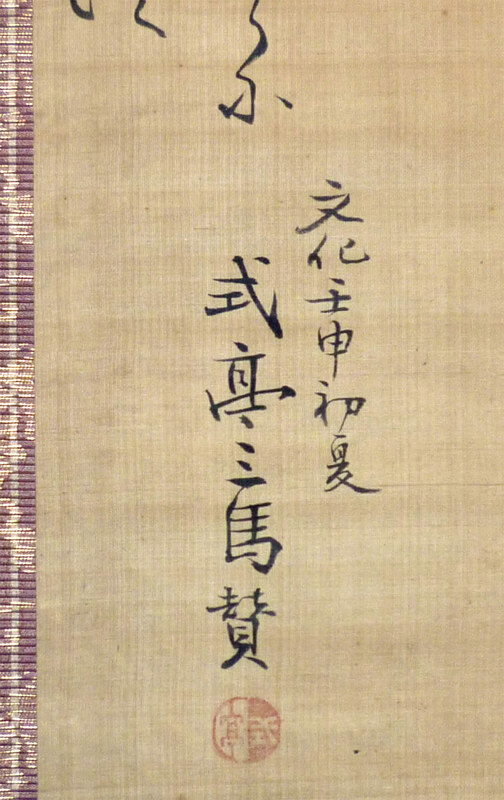 Published by Fukusendo, c 1815. 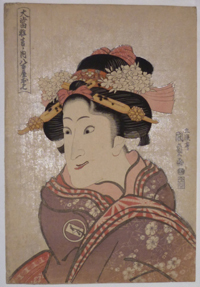 Other impressions in the Rijksmuseum, Amsterdam ( 1956:667 ) and illustrated in Ukiyoe Taikei, vol. 10, no. 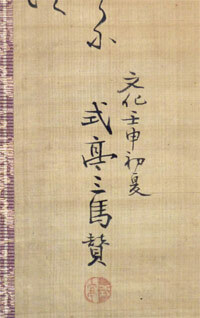 146, p. 99. Fine impression. Completely untrimmed. Very good colour with the purple intact and only slight turning at the edge. Slight loss of mica ( as usual ) and minor soil, otherwise very good condition. Signed Gototei Kunisada ga.